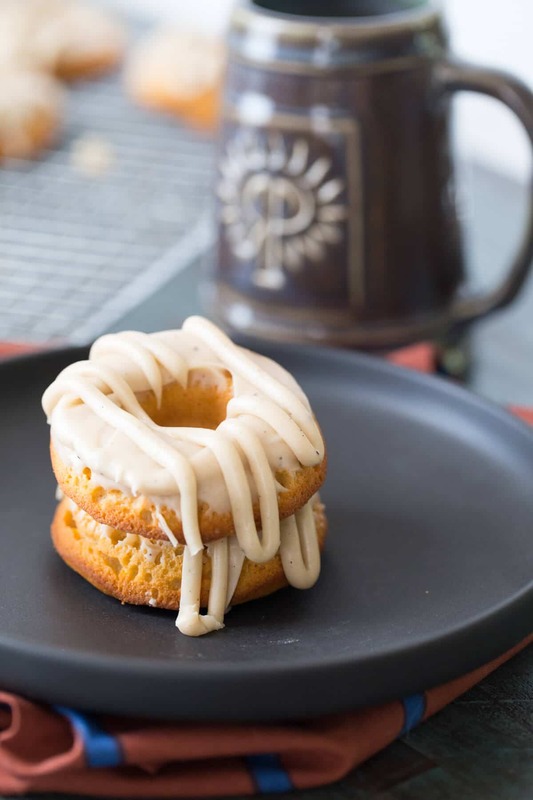 Soft and cakey baked sweet potato donuts are frosted with a sweet, creamy browned butter frosting. These little autumnal treats are sure to make your mornings! I was so excited when I made these donuts. I haven’t baked much with sweet potatoes. I’ve tried biscuits with great success, but nothing sweet. These baked sweet potato donuts were better than I had hoped. 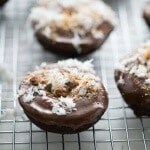 They were easy, sweet, soft and quick; all the essential requirements when it comes donut making. 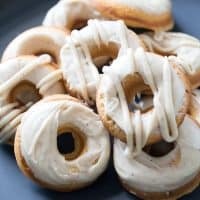 I’ve used browned butter enough ( in these cookies and on this quick bread) to know that it has the rich, deep, sweet flavor that would balance out the spices in these baked sweet potato donuts. The caramel-like frosting and the warm flavors of the donuts capture the cozy feeling of fall. While I was happy with my donut creations; I knew that, despite their tempting appearance, my family would shun these donuts if they knew they were made with sweet potatoes. So I did what any self-respecting person would do; I lied. Yes, I looked each kid in the eye and called these donuts pumpkin donuts. It worked. These donuts were devoured within minutes. The easiest way to bake up your sweet potatoes is in the microwave. Pierce them several times before you cook them to allow for steam to escape. I used two decent sized potatoes, you may need three if your potatoes are small. Only fill the donut pan cavities 1/2-3/4 full. If you fill them to the top, the hole will be filled and the tops will puff over. This isn’t the end of the world, but it will change the appearance of your donuts. Cook the butter for the frosting on medium until it turns amber and begins to foam. If you go too long, it will burn and turn black. Dip the top of the donuts into the frosting and set upright to set. 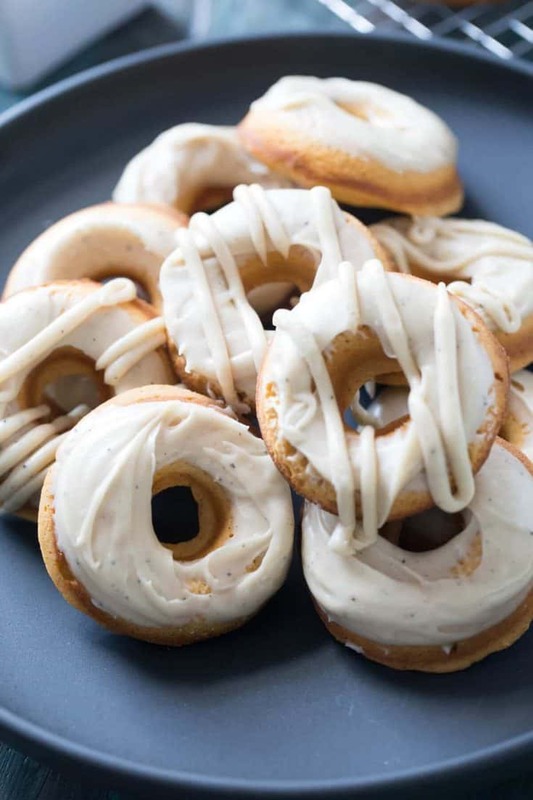 Place leftover frosting in a ziptop bag, snip the end and drizzle frosting over the tops of the donuts. 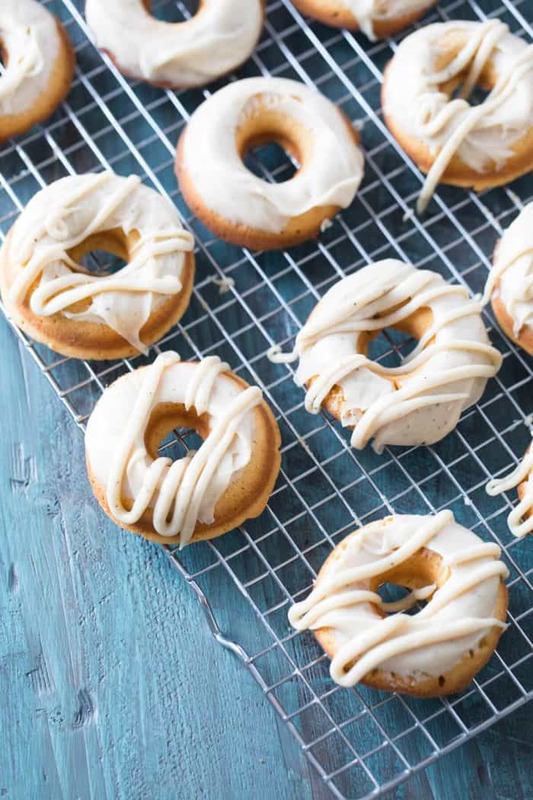 Lying to your family about the main ingredient in these donuts is strictly optional. These donuts will make believers out of anyone! Love Almond Joys? Thent this rich donut is for you! 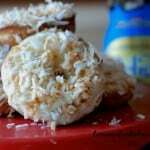 Toasted coconut makes these easy donuts dreamy! 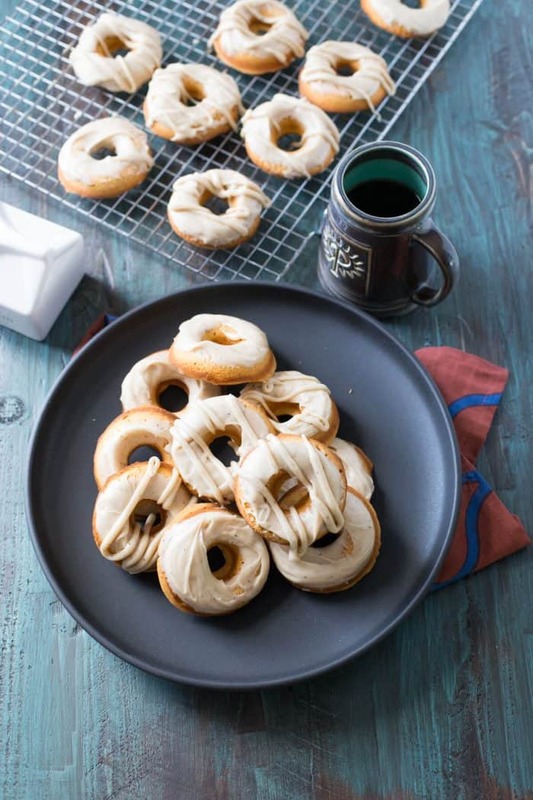 Maple and cinnamon are perfect pairs in this easy breakfast treat! 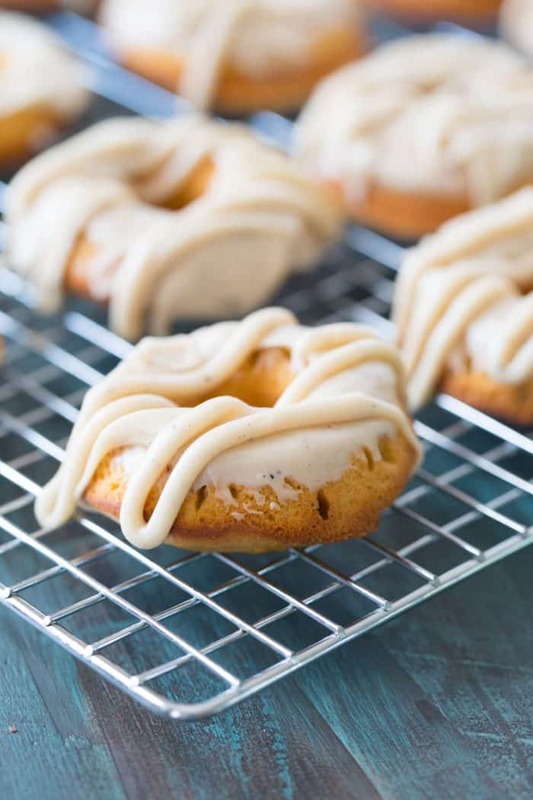 Soft and tender baked sweet potato donuts are covered in a sweet and creamy browned butter frosting. Preheat oven to 350 degrees. Spray two donut pans and set aside. Prick two large sweet potatoes with a fork. Microwave potatoes for 8 minutes, turning once. Remove potatoes and all them to cool until they are easy to handle. When ready, peel the potatoes. Place oil, eggs and sugar in the bowl of a stand mixer and beat until combined. Stir in sweet potatoes and mix until smooth. Mix in rum extract, cinnamon, nutmeg, ginger, and cloves. In a small bowl combine salt, baking powder and flour. Carefully and slowly add dry ingredients to wet ingredients. Beat until fully combined. Pour batter into a ziptop bag and pipe batter into the donut cavities filling 2/3 full. Bake for 15 minutes or until a toothpick inserted comes out clean. 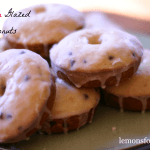 Remove the donuts and allow them to cool in the pan for 5 minutes before placing on a cooling rack. To prepare the frosting, place butter in a small saucepan over medium heat. Bring butter to a low boil, reduce heat and continue to heat butter until it begins to froth then turn a deep amber. Remove from heat. Whisk in powdered sugar and milk. When the donuts are cool, carefully dip the tops of the donuts into the frosting, place upright onto wax paper until completely set. Store donuts in an airtight container. 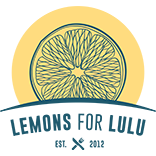 How much clove is used in this recipe? The recipe has “? teaspoon clove”. 1/3. The recipe program I use doesn’t seem to recognize 1/3. This is great for my “hiding the fruits and veggies” agenda when our granddaughter doesn’t touch them. They are being devoured, and I’m not telling that there are a whopping one-and-a-half cups of sweet potatoes in these! Haha, I know! 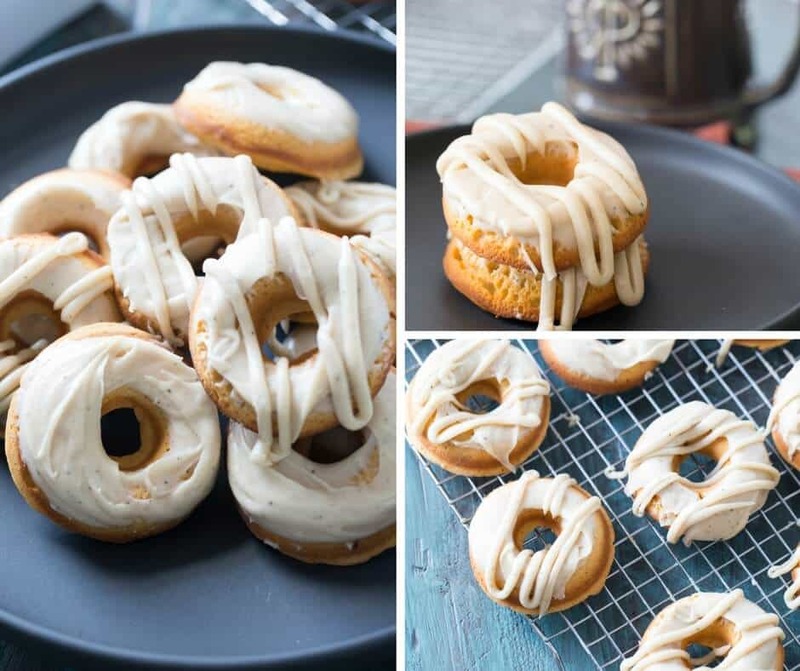 I told my kids they were pumpkin donuts!